Soaring high above the Peach State at almost 5,000 feet above sea level is Brasstown Bald, a staggering spectacle in the Chattahoochee National Forest. This point is the highest in Georgia, sitting about a half-mile above the surrounding land. On a clear day, this spot offers panoramic views of lush Appalachian forests and a distant downtown Atlanta. Brasstown Bald, GA, is just an hour drive from Glen-Ella Springs Inn and makes for a fun North Georgia day trip! We’ve listed a few of the reasons why you need to see it for yourself. For more local recommendations, be sure to check out our North Georgia Vacation Guide! You can reach the top of Brasstown Bald by car or on foot. Visitors with climbing experience and a sense of adventure typically choose to hike the Brasstown Bald Summit Trail, a steep half-mile trek with a paved footpath. There are many stopping points along the way, so you can take a break and enjoy the views at any time. For visitors looking for even more of a challenge, check out the three other available trails (that range from four to six miles in length). If hiking isn’t your thing, take the Brasstown Bald shuttle bus all the way to the top! Here are the three best reasons to pack your bags and head to this iconic spot. The climb up to the top of Brasstown Bald is a scenic experience. Many of the overlooks along the way offer some of the most beautiful vistas in the state, and you can even see the silhouette of the lookout tower from certain points. Once you reach the observation deck, you’ll have stunning views of much of the Southeast, from the Carolinas to Tennessee. Slip a quarter into the telescope for a closer look at the sweeping scenery! The 8,000-square foot visitor center at Brasstown Bald is open on weekends and features all kinds of interpretive exhibits. They detail the area’s natural history, ecology, and geology. History buffs love seeing what the mountain was like at the time of its Cherokee settlement, and nature lovers will enjoy learning all about the unique plant and animal species that call Appalachia home. At the base of Brasstown Bald, blooming Rosebay rhododendron flowers abound, but are replaced by purple rhododendron as the trail ascends. The trees at the base of the peak are a mix of large oaks and hardwoods. At the top, you’ll see an unusual dwarf forest where twisted branches of red and white oaks create a mysterious scene. Brasstown Bald offers a breath of fresh air during any season, with changing leaves in the fall, mild temperatures in the summer, and even some snow in the winter months! Relax After Your Hike at Glen-Ella Springs Inn! After an adventurous day overlooking the entire Appalachian southeast, come back to a comfortable and luxurious room at Glen-Ella Springs Inn! 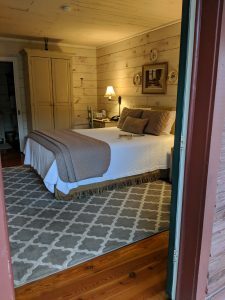 Our guests always love exploring the beautiful Blue Ridge Mountains, then returning to relaxation at our bed and breakfast in Clarkesville, GA. In the summer months, cool off with a refreshing dip in our pool, or cozy up in front of the fireplace in the winter. No matter which season you choose, you’ll experience total comfort and Southern hospitality when you stay with us! Don’t forget about our complimentary gourmet breakfast in the mornings and dinner at our on-site restaurant in the evenings. Whether you’re planning an exciting getaway from Atlanta or driving through the Blue Ridge from Asheville, there’s no better place to achieve tranquility. Ready to see Brasstown Bald, GA, for yourself? Check our availability today and start planning your trip!